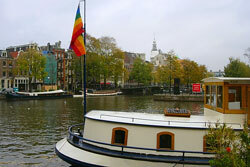 Houseboat 'Marjolein' was originally a cargo boat, built in 1913 in Woubrugge on the shipyard of Widow Boot. 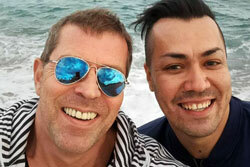 The boat was originally called 'Rival', but Rob renamed her 'Marjolein' after his longtime friend and niece. After a thorough inspection and maintenance operation on the wharf, he started to prepare the boat for a Bed & Breakfast. The boat's interior is designed in typical ship-like mahogany walls and authentic Art Deco/Nouveau details, upgraded to the standards of these days. But it retained its typical character, with sometimes narrow corridors, irregular shapes and typical ship-like details. Spending time on deck is an event in itself, from Spring to Autumn, and even sunny Winter days. Hundreds of small and larger boats pass you by on this junction of several canals in the heart of Amsterdam. Because the nearby bridges are quite narrow and low, there are no big cargo boats to disturb your peace. When the weather is less attractive, you can have your drinks in the heated steering cabin, with an overall view of all activities on the water and the lively river bank. And from anywhere above deck you have a beautiful view of the opera house and the historic Blaauwbrug (Blue Bridge, which isn't blue at all).